BRM was founded just after the Second World War by Raymond Mays, who had built several hillclimb and road racing cars under the ERA brand before the war, and Peter Berthon, a long-time associate. Mays' pre-war successes (and access to pre-war Mercedes-Benz and Auto Union design documents) inspired him to build an all-British Grand Prix car for the post-war era, as a national prestige project (which, naturally, he would drive himself!) with the backing (both financially and in kind and labour) of the British motor industry and its suppliers channelled through a trust fund. Their last victory was when Jean-Pierre Beltoise drove a stunning race to win the rain-affected 1972 Monaco Grand Prix with the P160. The 1972 campaign was generally chaotic: having acquired major sponsorship, Louis Stanley originally planned to field up to six cars (three for established drivers, three for paying journeymen and young drivers) of varying designs including P153s, P160s and P180s and actually ran up to five for a mix of paying and paid drivers until it became obvious that it was completely overstretched—the team's sponsors insisted that the team should cut back to a more reasonable level and only three cars were run in 1973 for Beltoise, Lauda and Regazzoni. The last notable performance was Beltoise's second position in the 1974 South African Grand Prix with the Mike Pilbeam- designed P201, an attractive car with pyramidal monocoque, very different from the curvy "coke-bottle" Southgate cars. The Owen Organisation ended its support of the team and it was run on a lower-key basis by Louis Stanley and some of the Bourne personnel as Stanley-BRM until 1977. Not sure when this was made, but I figure it dates from the early 80’s. 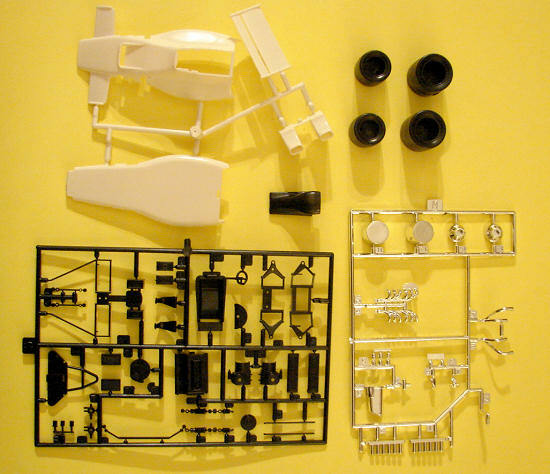 The parts are molded in white and chrome. The body is one piece, molded in white. The kit also includes a clear windscreen. Medal axles are also included. No flash was noted on any of the parts, nor are there any ejector marks. Fairly complete engine detail is provided as well as suspension detail. It has the same 1-piece, hollow tires as the Tyrrell. The instructions are 2 pages with 6 assem bly steps and a parts layout. No painting call outs are given but as the car is overall white, so that’s no problem. The decals are generic for a #17 car and show just a hint of yellowing. J. P. Beltoise drove the actual #17, but the decals don’t include the complete set. 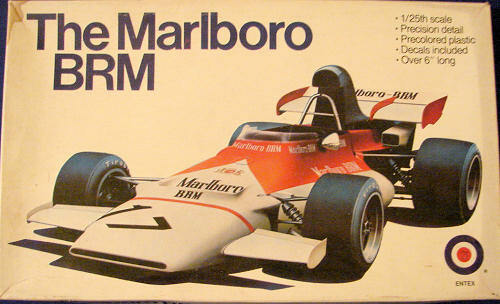 The Marlboro emblems are part of the red decal and may be hard to replace. These Entex kits are simple, but this kit should build into a nice model of a BRM. The old decals may be a problem as replacements are going to be hard to come by. 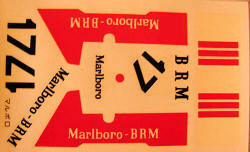 However, if you want a BRM, it’s the only game in town.